The best thing for me about this year's BYC was the opportunity to visit one of June's sons. I hadn't seen him since he left our house in August of 2011. Pictures were exchanged in the interim. The last ones I received were around the 13-15 month mark, and revealed a gawky but promising youngster. Imagine my surprise when Erin opened her front door and out came Kermit (Zephyr's Going Green at Macfield) charging across her yard at just under 2 years of age. 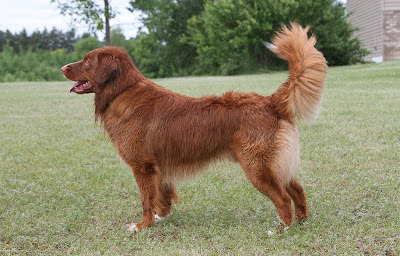 Lately it seems a number of Toller breeders have been producing whole litters they feel are “too good for a pet home”. Sometimes it’s in reference to structure; the breeder is convinced all of the puppies belong in show homes. Sometimes it’s in regard to drive; the breeder thinks all of the puppies belong in hunting homes or at least some kind of “serious” performance home. Sometimes it’s a combination of the two. As a fellow breeder I can certainly understand the sentiment. We spend a lot of time researching pedigrees, obtaining health clearances and putting titles on our dogs to promote their worth. Raising puppies is a lot of work and we want the best for all of our pups. However, since all of our Tollers are pets first, and whatever else they turn out to be second, I have a hard time wrapping my head around the concept of breeders who won’t sell puppies to people who "just" want a pet. Some of the most wonderful homes we have placed our puppies in over the years are "just" pet homes. These homes are wonderful because they made their Toller an integral part of the family and provided excellent opportunities for socialization, as well as both mental and physical stimulation, though sometimes by less traditional methods than hunting. 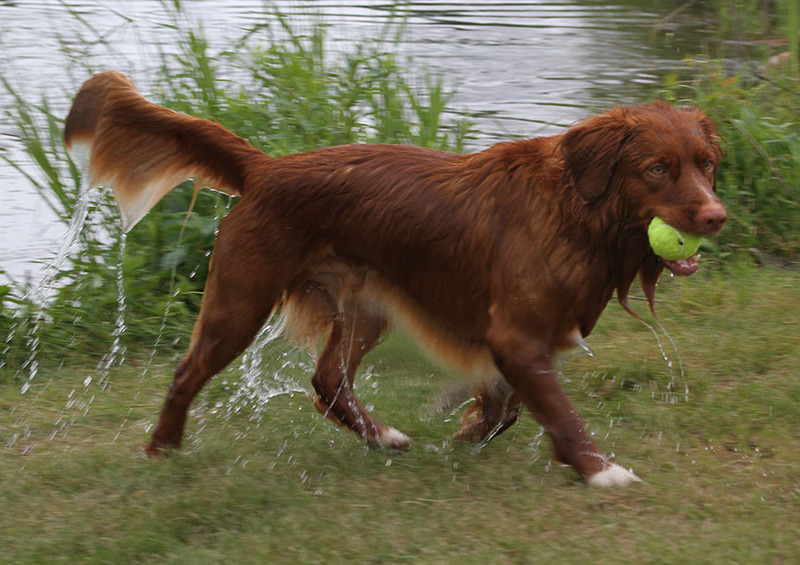 Tollers can be great therapy dogs, jogging companions or kayaking partners. 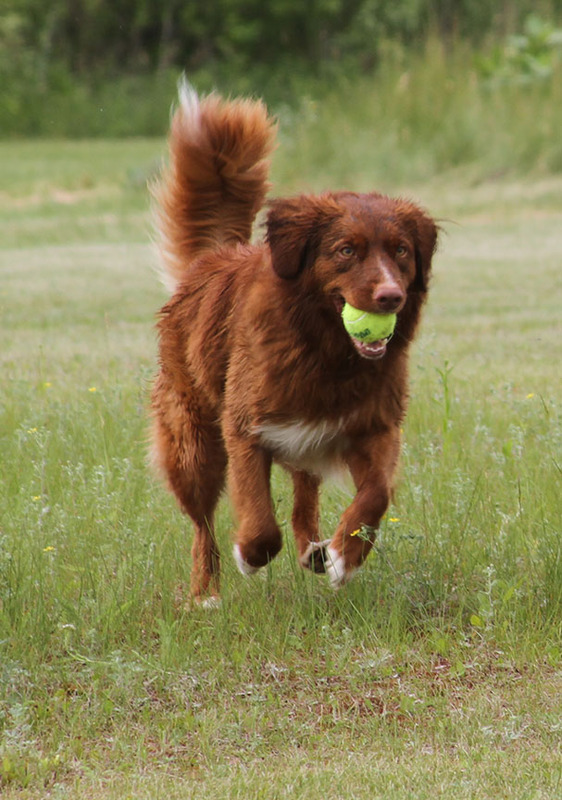 Although most Tollers thrill to the sight of a duck or the sound of a shotgun, what's most important to them is active, supportive engagement in a caring household. Over the years a rather common question asked of me in the course of puppy inquiries is, “do you sell to pet homes?” While I can’t speak for other breeders, my own response to that question is, “well of course we sell to pet homes!” I go on to explain how in our experience a litter of puppies tends to be like children within a family. Although they will have many similar characteristics, they may also have different interests and abilities. Some will excel at sports, others at math, while some may be content to coast a bit more through life. To offset this, we try to get a mixture of people on our waiting list for puppies who have different interests and expectations. It is our job to match each puppy to the right home. So far this model has worked well for us. This is not to say we never have puppies we hold back or wish to consider only for a specific type of home. However, if I feel that way as a breeder, I believe it is my responsibility to keep and nurture the puppy until the right home comes along. Sometimes I am fortunate enough to find a local home to place the puppy in where bringing out the special qualities I see in the pup becomes a team effort. If a breeder is unwilling to consider pet homes for any puppies within a litter due to the stated drive of the puppies, it begs the question of whether there is a proper emphasis on producing puppies who meet the breed standard in regard to temperament. Our standard states, "He is affectionate and loving with family members and is good with children, showing patience."